I am a Grey’s Anatomy fan and a crazy one, I have sleep walked through days, bleary eyed, all because I was binge watching this one show. I am not sure how others feel about it or whether they even follow it. But so far as I am concerned, I love the way they pick up myriad topics and weave it beautifully in their narrative. Still, even I wasn’t prepared for what they had lined up in the latest episode, ‘Silent All These Years’ (S15 E19), that I watched recently. It centred around a woman who was sexually assaulted and is wary of reporting the incident. She is terrified and under extreme stress, so much so that even a loud noise or the sight of a strange man is enough to startle her. The attending doctor, Jo, is extremely sensitive and ensures that she is examined only by female doctors and when they wheel her to the OT, the hallways are lined up with women on both sides to make her feel comfortable. Its more than 100 women of varied colours, sizes and ages who just silently egg her on as her gurney wheels through. There is something so powerful about that one scene and I could feel that those women were not acting. It was sheer empathy on display. 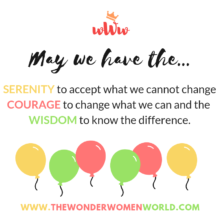 We do have communities, online platforms, women tribes…. all in an effort to reach out to our sisters but on a daily basis we come across females trying to put each other down. 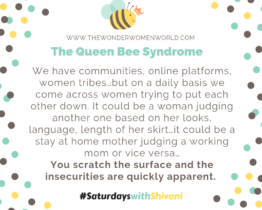 It could be a woman judging another one based on her looks, language, length of her skirt… it could be a stay at home mother judging a working mom or vice versa… you scratch the surface and the insecurities are quickly apparent. I want to go so far into saying that I have seen women, who in fact, pander to men just to be popular. Though ‘being in others shoes’ is the operative phrase but aren’t we all IN the same shoes, so shouldn’t it be easier for us to understand the problems that we face. And yet, quite often, women fail to create a conducive environment for each other, neither at workplace nor at home. It’s a little like the crabs in a basket…. if one tries to escape, the others grab it and pull it back. The result is all the crabs stay where they are. This is the single most important reason why it is taking women so long to scale bigger heights and lead more fulfilling lives. In the name of feminism, male bashing is easy. He’s the common enemy who serves to unify women as they conveniently hold men responsible for every slight, every injustice that has ever happened to womankind. Women need to clean up their act and lead by example if they want the situation to change in any time soon. This is not to say that all women are in the wrong, but for every well-meaning step forward, we are still taking quite a bit backwards too.